Hellllllo! I snapped these after I came home from the Flea market….so if I look a little tired and dusty….I AM! You will notice in my hand what appears to be an ice coffee. Oh no, friends. I was so parched and exhausted I went for the full monty and got a Salted Caramel Mocha Frappuccino…..which was delishus and decadent. It totally doesn’t count as a coffee, it’s a dessert. But back to today’s style post. Working at the flea market is one of the biggest style challenges you can imagine. On the one hand, you want to look cute. 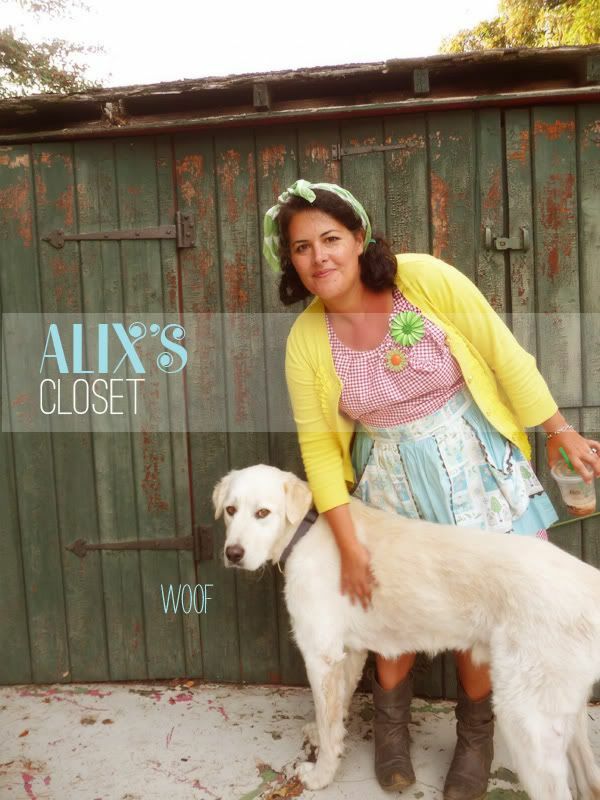 You’ll be chatting up 100s of potential customers and looking presentable and somewhat stylish is half the battle in convincing them to buy your vintage wares. On the other hand, you NEED to be comfortable. You’ll be on your feet for 11 hours not to mention braving the yo-yo-ing weather (freezing in the foggy bay-side morning! roasting in the midday sunshine without an awning!). So what’s a fashion loving girl to do? MIX IT UP! + Red Gingham Dress. Believe it or not. TARGET. People always think it’s vintage and I think styling it up to look that way is pretty easy peasy. I bought it over the summer. I’ve seen some on their sale racks still. + Yellow cardigan. You’ve seen this one before. Target. 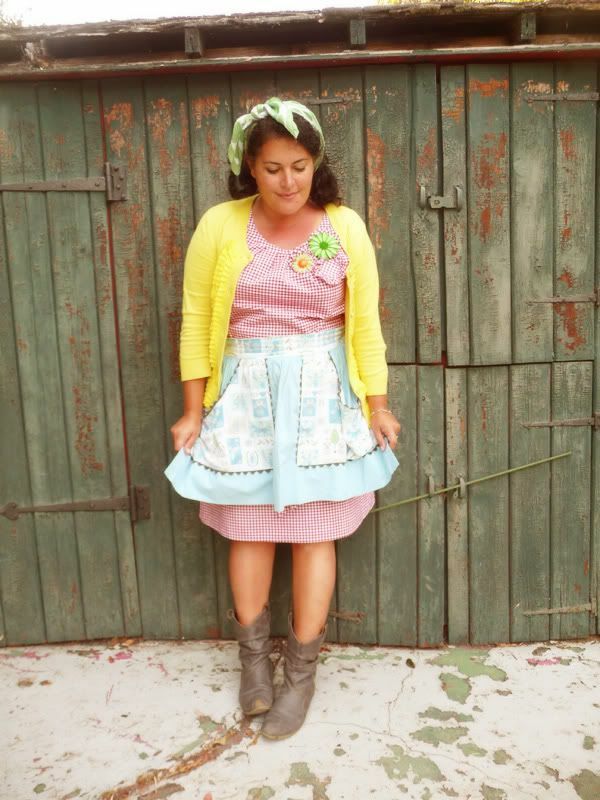 + Vintage Apron. Belonged to my beloved Tante Maria. Not only was a cute style element, but also practical. The pockets were perfect for tucking in money! + Vegan cowboy boots. Old Navy. These suckers I bought on a whim. They aren’t leather. And they aren’t even particularly fancy/cute or anything….but lord have mercy they are COMFY. I can stand in them for hours. These are pretty similar. Mine don’t have those buckles on them though. + Vintage enamel flower pins. My go-to to spruce up any outfit. + Vintage scarf in my hair. I discovered this trick while in sweltering South Carolina this summer….keeps you nice and cool. We weren’t expecting it to get as hot as it did and I totally got a sunburn on my chest. Very glamorous no?? Luckily I didn’t take a picture of my hands, which were TOTALLY grimey. It’s outdoors and dusty, plus handling all that money and old goods….I looked like pig pen’s big sister. So there you have it. I felt comfy AND cute…and my outfit attracted a lot of positive attention from people who would pause at our booth to say a nice word about my apron or pins, and then browse our loot. 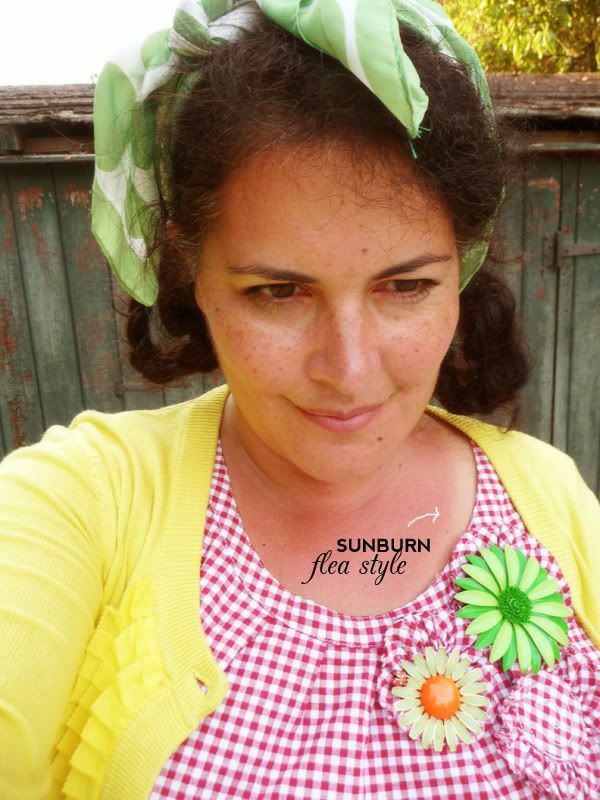 To me, it was the perfect outfit to wear to the flea market….whether selling OR buying! You always look so stylin’. 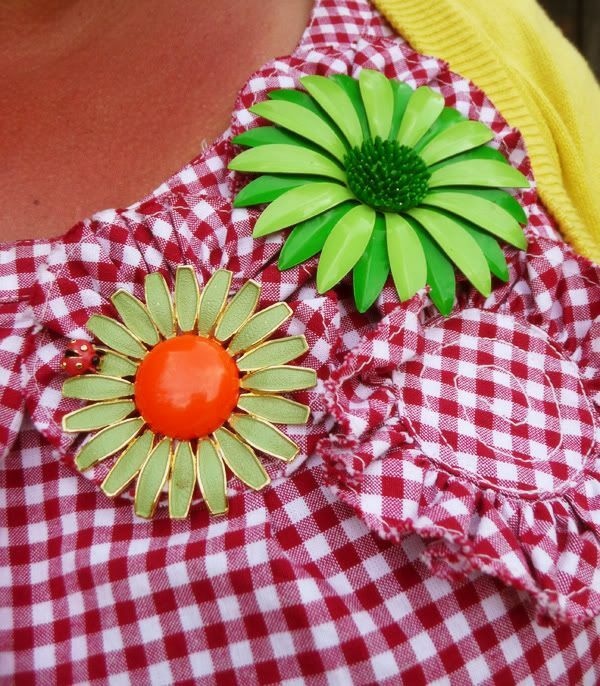 That dress has the perfect brooch mounting areas. I have a pair of red Wellington boots I used to wear to my markets on wet mornings. Love the photo bombing doggie! Aw Cinti you are too nice! I love Wellies too…. Sammie is stealing the show!!! !